Braun mentioned Trump during his election night victory speech. 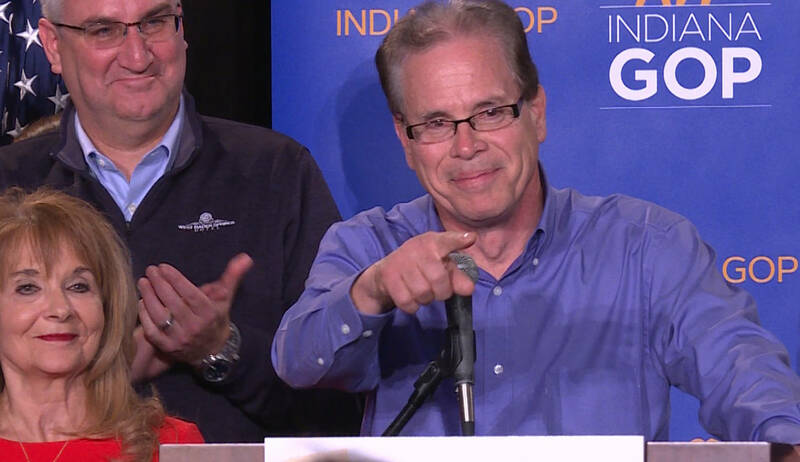 Republican Mike Braun’s senate win over incumbent Democrat Joe Donnelly says just as much about President Donald Trump as it does about him. The alliance the two formed during Braun’s campaign resonated with many voters. It was hard to tell whether the Indiana GOP’s election night watch party was a celebration of victories in the state this week, or Trump’s performance as president. Many voters at the party say they supported Braun because they know he’ll support Trump. Zionsville resident Tom Kmetz says he likes that Braun isn’t a Washington insider. He sees a lot of similarities between Braun and Trump. “I like Mike Braun because he’s a businessman and I think he’s the best return on investment we have,” Kmetz says. Indianapolis resident Bob Laux says he thinks Trump’s critics are being too hard on him, and he knew a vote for Braun was a vote for Trump. Laux says he disagrees with Senator Donnelly’s stance on immigration and doesn’t approve of his decision to vote against Justice Brett Kavanaugh. During his concession speech Tuesday night, Donnelly said he did what he thought was best for Hoosiers during his time in the Senate.